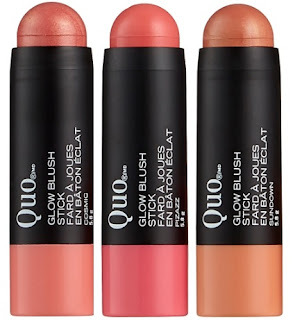 Get glowing with a blush from Hard Candy, Quo and Beautycounter! Hard Candy Cheeky Tints Sheer Blush Gels - $7.98 - in 6 shades: Ballerina, You're A Doll, Goddess, Diva, Geisha and Surfer Babe - A water-light gel blush that has all day staying power. Incredibly easy to blend, mistake-proof formula, gives a sheer wash of colour for a truly natural flush. 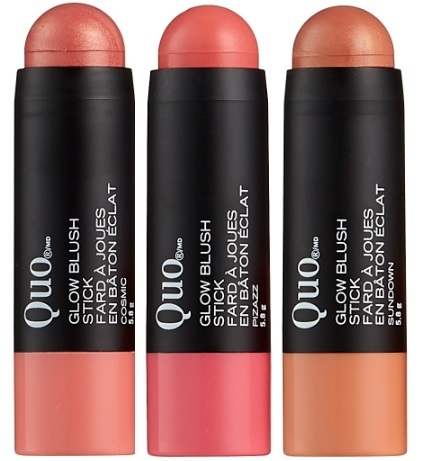 Quo Glow Blush Stick - $15 - in 3 shades: Cosmic, Pizazz and Sundown - with buildable colour and smooth texture that blends softly and seamlessly into the skin for a delicate powdery finish. Beautycounter Colour Pinch Cream Blusher - $46 - in Caramel, Hibiscus and Umber - brightens cheeks with natural, dewy colour with a formula containing jojoba ester and carnauba wax to condition and hydrate the skin, making it smooth, non-sticky and easy to apply.